ShrinkTheWeb How Do I Refresh a Screenshot? Screenshots can be refreshed by using the Refresh On-Demand PRO Feature. For all users without the Refresh On-Demand PRO Feature, you may still manually refresh an unlimited number of thumbnails through the ShrinkTheWeb Thumbnail History page. We provide this to correct the occasional thumbnail that comes back blank or broken. 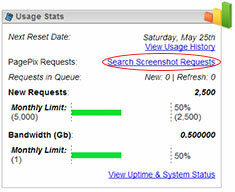 Find the Usage Stats box in the Dashboard and click the "Search Screenshot Requests" link. This will take you to the Thumbnail History page and allow you to search for the specific domain. Note: If the site you are searching for does not come up first make sure the spelling is correct, that you are searching with or without the WWW according to how you've made the request on your site, and then try clicking "Show requests by any user (not just those still linked to my account)." Sites are linked to the first user to request OR most recent user to refresh. Click the drop down arrow under Operations, select "Refresh", and click Go. The specified thumbnail has been added to the queue for recapture. Please be patient as there is no guarantee on capture times for users without dedicated generators. Note: You can select "Status" and click Go to check if the refresh has been completed. The following link covers how often ShrinkTheWeb refreshes web page screenshots.